With the sun shining and the mild temperatures, the spring is the perfect time to start your fence installation project. Just as quickly as winter left us, summer is right around the corner. For those in the market for a new fence, professional contractors’ worker orders can fill up fast. 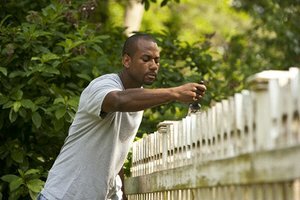 To have a fence installed on your schedule, make an appointment in the spring! If you want a new fence to set your home up for the summer, you are not alone. When the snow melts and the weather almost allows for shorts, homeowners are putting in their orders for fence installations. Unfortunately, everyone has the same exact idea at the same exact time, and it can be hard to have a fence installation that works around your schedule. The longer you wait, the harder it will be to book an appointment. If you still think you can put off your fence installation, don’t be disappointed when you find out most companies will have a hard time squeezing you in. The spring normally provides mild weather, and this is the perfect time for a professional contractor to install your fence. For winter fence installations, you probably wouldn’t even want to step outside to see the progress of your new fence. With warmer weather, you can check on the progress of your fence, as well as enjoy the craftsmanship. Aside from not wanting to do this when it’s too cold, you also wouldn’t want to check on your fence installation project in the blazing heat. From planting a garden to lounging by the pool, summer provides us all with peace and tranquility. If you install a fence during the summer, however, you may find a few interruptions in your plans. When you get your fence installation completed in the spring, it will leave you with more time to enjoy yourself during the summer. Any type of big project like a fence installation can easily weigh on your mind, so why not get it out of the way now? In the meantime, if you have any questions aboutfence installation, please contact Freedom Fence and Home by calling 443-271-6841 or visit our website. You can also follow us on Facebook and Twitter! This entry was posted on Friday, April 10th, 2015	at 1:20 pm	. Both comments and pings are currently closed.